Weston Gardens, a Fort Worth Historical Site, minutes from downtown Fort Worth where visitors and their pets are welcome to tour the demonstration gardens at their leisure and enjoy the sculptures we have placed throughout the grounds. Historically, families have celebrated the beautiful occasion of marriage in the wedding court and individuals used to dance the night away on Old Ironstone, our two story ship, since 1942. 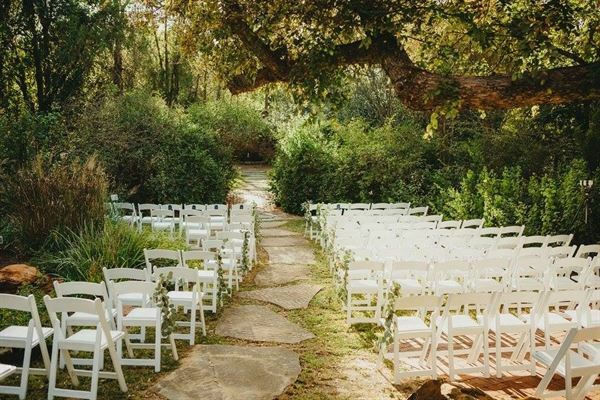 Our Historic Gardens make a perfect backdrop for all celebrations whether it is a meeting, luncheon, wedding ceremony, reunion, bridal or baby shower. There are many different 'rooms' in the gardens. Use one or all, depending on your event and your personal prefrences. Because people feel that a garden is meant to be shared; you will be able to create a tradition to revisit the gardens for years to come. You will enjoy the beautiful and serene setting of the English Style Gardens, amazing stonework and flowing waterfalls. You will be lost in the stone grottos, hidden nooks, and beautiful lily ponds. 50 or Less Guests: Morning 8:00am to 12:00pm | $2,250 Afternoon 12:00pm to 5:00pm | $2,500 Evening 5:00pm to 10:00pm | $3,900 51 to 150 Guests: Morning 8:00am to 12:00pm | $3,000 Afternoon 12:00pm to 5:00pm | $3,500 Evening 5:00pm to 10:00pm | $4,200 151 to 250 Guests: Morning 8:00am to 12:00pm | $3,500 Afternoon 12:00pm to 5:00pm | $4,500 Evening 5:00pm to 10:00pm | $5,000 251 to 300 Guests: Morning 8:00am to 12:00pm | $4,000 Afternoon 12:00pm to 5:00pm | $5,500 Evening 5:00pm to 10:00pm | $6,500 All Packages Include: • Total Five to Nine Hours On-Premise Time that includes: • Four Hours Event Time • Dressing Room Time • Decorating Time Also Included: • On-Site Coordinator • One Hour Rehearsal • Unlimited Access for Portraits (during garden open hours only) • Four Hours DJ Services • Tables, Chairs & Ivory Table Cloths • Set Up & Clean Up Event hours listed above include 1 hour of guest arrival time. Your actual event time is four hours. (example: evening events = 6pm to 10pm. Ceremonies usually begin at 6pm or later. Fall and Winter events may start earlier due to limited daylight hours and possible ceremony start times are determined in conjunction with Weston Gardens.) Access times: Morning events 7:00am, Afternoon events 9:00am, Evening events 1:00pm. For events of over 300 people, contact Weston Gardens for a price quote. Wedding Celebrations require an additional Security Deposit & Event Insurance. Alcohol fee is additional and based on number of guests and alcohol being served. To secure your date, Weston Gardens provides three payment options. Either 50% down and final payment 60 days prior to event or 25% down and monthly installments. If you wish to pay your event in full upon booking, Weston Gardens offers a 2% discount if paid by credit card and a 5% discount if paid via cash or check. 50 or Less Guests: Morning 8:00am to 12:00pm | $2,500 Afternoon 12:00pm to 5:00pm | $4,800 Evening 5:00pm to 10:00pm | $4,800 51 to 150 Guests: Morning 8:00am to 12:00pm | $3,500 Afternoon 12:00pm to 5:00pm | $4,800 Evening 5:00pm to 10:00pm | $4,800 151 to 250 Guests: Morning 8:00am to 12:00pm | $4,000 Afternoon 12:00pm to 5:00pm | $5,800 Evening 5:00pm to 10:00pm | $5,800 251 to 300 Guests: Morning 8:00am to 12:00pm | $4,900 Afternoon 12:00pm to 5:00pm | $6,500 Evening 5:00pm to 10:00pm | $6,500 All Packages Include: • Total Five to Nine Hours On-Premise Time that includes: • Four Hours Event Time • Dressing Room Time • Decorating Time Also Included: • On-Site Coordinator • One Hour Rehearsal • Unlimited Access for Portraits (during garden open hours only) • Four Hours DJ Services • Tables, Chairs & Ivory Table Cloths • Set Up & Clean Up Event hours listed above include 1 hour of guest arrival time. Your actual event time is four hours. (example: evening events = 6pm to 10pm. Ceremonies usually begin at 6pm or later. Fall and Winter events may start earlier due to limited daylight hours and possible ceremony start times are determined in conjunction with Weston Gardens.) Access times: Morning events 7:00am, Afternoon events 9:00am, Evening events 1:00pm. For events of over 300 people, contact Weston Gardens for a price quote. Wedding Celebrations require an additional Security Deposit & Event Insurance. Alcohol fee is additional and based on number of guests and alcohol being served. To secure your date, Weston Gardens provides three payment options. Either 50% down and final payment 60 days prior to event or 25% down and monthly installments. If you wish to pay your event in full upon booking, Weston Gardens offers a 2% discount if paid by credit card and a 5% discount if paid via cash or check. 50 or Less Guests: Morning 8:00am to 12:00pm | $2,500 Afternoon 12:00pm to 5:00pm | $5,500 Evening 5:00pm to 10:00pm | $5,500 51 to 150 Guests: Morning 8:00am to 12:00pm | $3,500 Afternoon 12:00pm to 5:00pm | $5,500 Evening 5:00pm to 10:00pm | $5,500 151 to 250 Guests: Morning 8:00am to 12:00pm | $4,500 Afternoon 12:00pm to 5:00pm | $6,500 Evening 5:00pm to 10:00pm | $6,500 251 to 300 Guests: Morning 8:00am to 12:00pm | $5,600 Afternoon 12:00pm to 5:00pm | $7,200 Evening 5:00pm to 10:00pm | $7,200 All Packages Include: • Total Five to Nine Hours On-Premise Time that includes: • Four Hours Event Time • Dressing Room Time • Decorating Time Also Included: • On-Site Coordinator • One Hour Rehearsal • Unlimited Access for Portraits (during garden open hours only) • Four Hours DJ Services • Tables, Chairs & Ivory Table Cloths • Set Up & Clean Up Event hours listed above include 1 hour of guest arrival time. Your actual event time is four hours. (example: evening events = 6pm to 10pm. Ceremonies usually begin at 6pm or later. Fall and Winter events may start earlier due to limited daylight hours and possible ceremony start times are determined in conjunction with Weston Gardens.) Access times: Morning events 7:00am, Afternoon events 9:00am, Evening events 1:00pm. For events of over 300 people, contact Weston Gardens for a price quote. Wedding Celebrations require an additional Security Deposit & Event Insurance. Alcohol fee is additional and based on number of guests and alcohol being served. To secure your date, Weston Gardens provides three payment options. Either 50% down and final payment 60 days prior to event or 25% down and monthly installments. If you wish to pay your event in full upon booking, Weston Gardens offers a 2% discount if paid by credit card and a 5% discount if paid via cash or check.